When it comes to conducting the transaction, there are various ways to pay the money. Some people prefer using credit cards for making payments while others use simple cash. The type of method used for making the payment completely depends on the needs of the customer. Some people find it more appropriate to pay through credit card than cash. Similarly, some people feel more comfortable paying through cash. Just like customers, some businesses also have limitations. There are some companies that accept money only through cash. When the cash payment is received from the customer, the company makes a cash payment receipt and hands into the customer. Money is paid or received whenever you purchase or sell a product or service. A cash payment receipt gives the proof that you bought a product or hired a service and paid for it. It can be a premium or complete payment at one time. What is a cash payment receipt? The cash receipt includes the price of every product purchased by the buyer. The total bill is also mentioned in the receipt. The receipt lets the customer know about the total amount he is liable to pay after rendering the services. A cash payment receipt is an instrument which shows when, where, why and by whom the payment was made and received. A payment receipt can be useful for many purposes, from record keeping to stock and ledger maintenance, from tax filing to tracking of shipment and claiming a refund, etc. Cash payment receipt can be used or asked for any time by the customer or the service provider depending upon the requirement and issue at hand. The receipt can be provided on demand of the customer or as a routine with every purchase. But professional companies and stores provide it with every purchase to avoid issues later on. 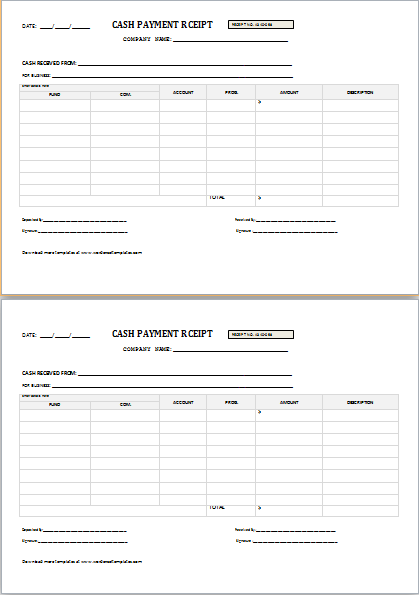 Cash payment receipt template can be used to generate the receipt when the transaction is to be conducted in the form of cash. The cash payment receipts are considered as important document whenever one party pays the money through cash. The money paid in the form of cash is associated with more risk since other methods are electronic and also involve proofs. But, when you are making the payment in the form of cash, you should keep everything in writing to keep the record. 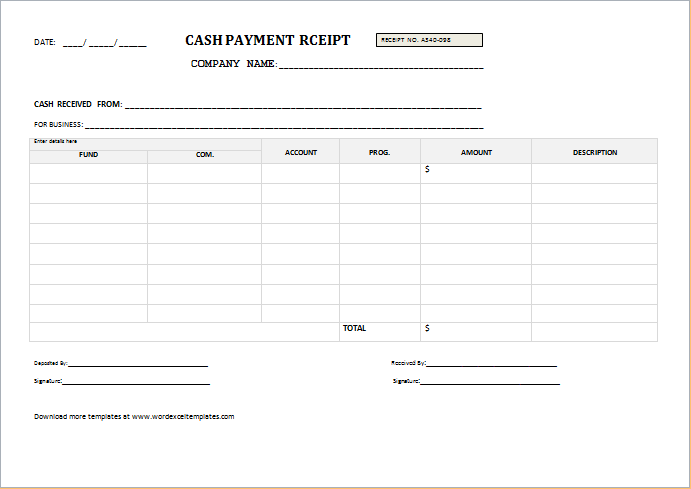 The cash payment receipt template helps in keeping track of the cash payments. What are the benefits of using the cash payment receipt template? The receipt template ensures that the transaction has been recorded properly. The process of tracking the transactions in a specific period of time is accelerated when the template is used. The user does not need any expertise or knowledge for using the template since it is very easy to use and understand. The user can customize the template to meet his needs.